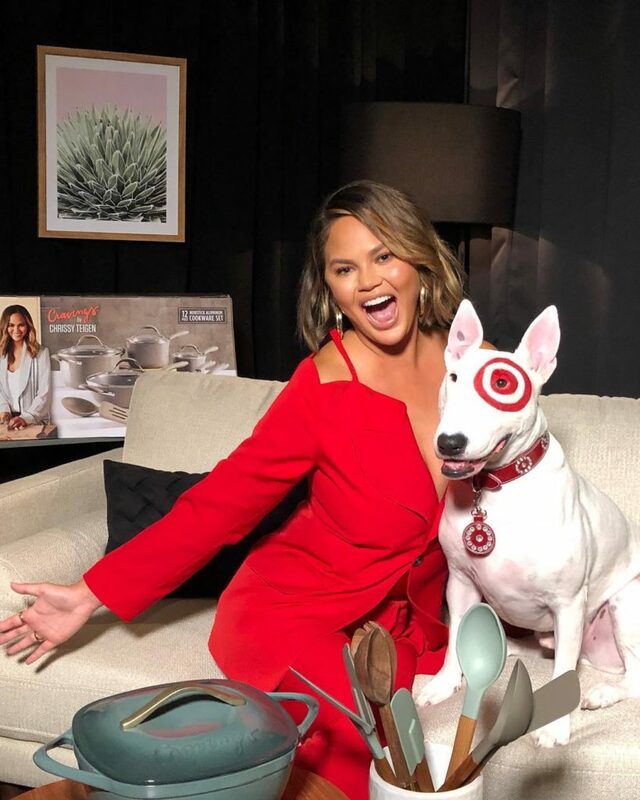 Chrissy Teigen is known for her refreshingly honest wit, her good sense of humour, and the roasting of her husband. While she’s everybody’s favorite cool girl, there’s a lot to learn from this Sports Illustrated model on how to plan your day, achieve balance and go for what you want. Chrissy is a firm believer in enjoying life, living it to the full and having fun. She’s not ashamed to go for what she wants, to work hard, play hard, and enjoy her family life, and she’s a great example of a modern day woman and mother who can balance it all well. Chrissy wakes up around 7:30 and checks her emails first thing, it’s important that both she and John check their busy schedules and figure out what’s happening during their day. There are a lot of emails to go through, so they make sure they’re on track before they do anything. If they’re required to do something early or answer something quickly, that way they’re on top of everything. Chrissy will usually go back to sleep and wakes up again at 9 to check her emails again and respond to any replies. It’s a strange morning ritual, but it’s one that helps her stay on top of the day and get a bit of extra sleep (which she needs with two kids!). “I work out every day,” Chrissy says. Her go-to routine comes from Body by Simone, and is a fusion of pilates, barre method, dance cardio, and strengthening moves. “A lot of classes don’t feel like they’re tough enough on you, but some trainers have you rolling tires and stuff. And I’m like, ‘OK, I need something in between that!” Body by Simone is a good workout combo between a tough workout and something a little more gentle. What we can learn from this is that no matter how busy you think your life is, there is always time to work out. 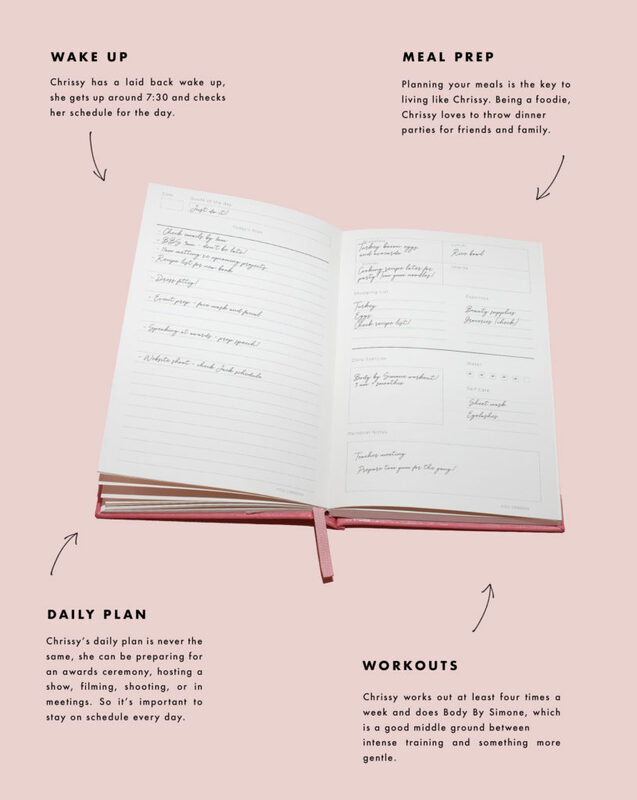 If you’re starting your fitness journey now don’t worry, there’s a whole year ahead of you to smash, so if you need a little more help, start logging your fitness goals and where you want to be in the Fit Is The Sh*t planner. Chrissy is extremely hands-on with her job. She occasionally presents, works with brands like Target and has two cookery books under her belt. If you’re imagining a busy life, you’re not wrong. “I never had any set goals. What motivated me was seeing other people do stuff. Like,’Wow, she has a cookbook and she’s not a chef, so I can have a cookbook now?” That’s how I grew in confidence.” she told Elle. Figuring out that you can try anything, that you’re capable of anything as long as you try it, and that there are no rules about what you can and can’t do is a huge eye-opener. If it worked for Chrissy, it’ll work for you. Chrissy loves spending time with her friends and family and often throws dinner parties or events with her nearest and dearest. She lives with her mother, so spends a lot of time with her and has a constant source of advice, inspiration, and help with the children whenever she needs it. Family and friends are important to Chrissy, which is why she spends so much time with them, she describes herself as getting attached to people easily and enjoys cooking for the people she loves. Making time for the people that matter in the evenings is super important, Chrissy is very vocal about how spending time with her family has boosted her mood and improved her well-being. Your evening routine needs to allow you to focus on what matters and recover after a busy day. You can use the Getting Stuff Done planner to keep track of all the ways you’re taking care of yoursel, which will help you get ahead. Chrissy loves Creme de La Mer and has been using it for years. Another beauty tip Chrissy swears by is water. “The foods I love aren’t necessarily great for my skin, so [I drink] a ton of water. You can do facials and extractions, but it all comes from what you’re ingesting and making sure you getting enough water. Everyone says it, and it sounds too easy, but yeah, it’s true.” she told Total Beauty.